Cyanobacteria displaying a green fluorescent tag. Image: Queen Mary, University of London. eanna Conners reports in earthsky.org that a collaboration of scientists from Queen Mary, University of London, the Imperial College London and the University College London have discovered a biological switch in blue-green algae that reacts to light and changes how electrons are transported within the cells. Their results were published on July 10, 2012 in Proceedings of the National Academy of Sciences. 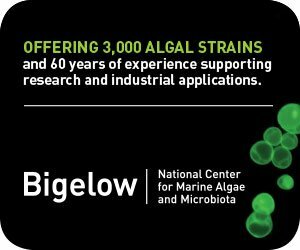 These findings, the researchers suggest, could help optimize biofuel production by algae. Lack of light is often a major constraint in non-heterotrophic algae biofuel production systems because algae need light to photosynthesize. 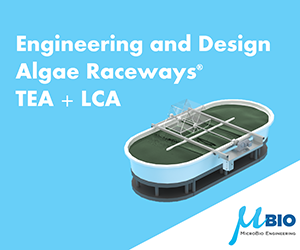 Attempts to increase the amount of light delivered to algae in bioreactors typically involve the use of energy-demanding mixing systems or smaller and more expensive growth chambers. Alternatively, scientists could try to improve the way that algae grow under low light conditions. But first, they need to more fully understand how the biological molecules within cells respond to light. To examine how cyanobacterial cells respond to light, scientists in this study attached a green fluorescent protein tag to two key respiratory complexes in the species Synechococcus elongatus. Then they exposed the cyanobacterial cells to either low light or moderate light conditions in the laboratory and tracked changes in the cells. The researchers discovered that brighter light caused the respiratory complexes to redistribute throughout the cells from discrete patches into more evenly distributed locations. The result was a greater probability that electrons would be transported to photosystem I, an integral component of the photosynthetic complex in the algae cell. The scientists are trying to determine what controls these circuits, what makes electrons take a specific route, and what switches are available to send electrons to other destinations. According to Conrad Mullineaux, microbiology professor at Queen Mary, University of London and co-author of the paper, findings from the study could be exploited in engineering algae for improved biofuel production. 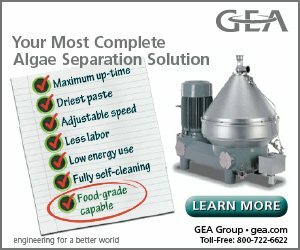 Copyright ©2010-2012 AlgaeIndustryMagazine.com. All rights reserved. Permission required to reprint this article in its entirety. Must include copyright statement and live hyperlinks. Contact editorial@algaeindustrymagazine.com. A.I.M. accepts unsolicited manuscripts for consideration, and takes no responsibility for the validity of claims made in submitted editorial.